(Nanowerk News) Space agencies examine the extent of greenhouse gases in the air via prisms and gratings in satellites. 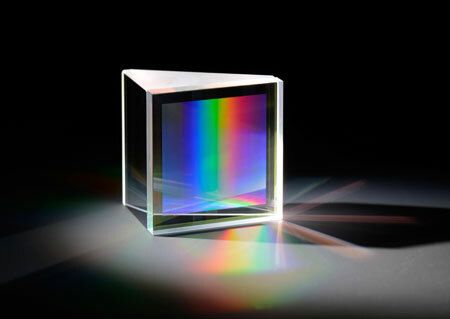 New technology now makes it possible to connect both components with each other so that they are suitable for space thus achieving a new level of quality for spectral resolution. In addition to industrial CO2 emissions, agriculture also contributes significantly to climate change: above all methane (CH4) and nitrous oxide (N2O), which are released in large quantities due to livestock and fertilization. With spectrometers brought into space via satellite, space agencies are now able to measure the amount of greenhouse gases in the air. These spectrometers analyze the light reflected from the earth by dissecting it into its component colors. To attain the highest possible resolution, grating and prism structures are combined: prisms deflect blue light the most intensively, while grating is best at bending red light. But so far it has hardly been possible to combine the two structures so that they would be suitable for space. Normal adhesive is not an option: It absorbs light (thereby distorting the measurement result), is sensitive to radiation and ages too fast. Researchers at the Fraunhofer Institute for Applied Optics and Precision Engineering IOF in Jena developed a way that defies the inhospitable conditions in space and does not affect the measurement result. They are working together with the German Aerospace Center (DLR) and the European Space Agency ESA. "We combine the optical elements with each other at the atomic scale, namely via oxygen bridges," explains Dr. Gerhard Kalkowski, scientist at the IOF. "In this way, we will provide the key for high-resolution systems made of prism-grating structures to also be able to be used in space in the future." The technology, which is already known in the field of silicon wafers, is called hydrophilic bonding. In this process, oxygen and hydrogen atoms are bonded to the wafer’s surface. By pressing the surfaces together at elevated temperatures in a vacuum, rigid (covalent) oxygen bonds form between the two parts. Among other things, the challenge was to accurately position the grating and prisms in relation to each other. The scientists thereby produce a mechanical edge on the grating which precisely corresponds to the grating history. "The orientations deviate by only about an arc minute, as required – one arc minute is the 60th part of a degree angle," Kalkowski says. Initial prototypes passed successfully tests by the ESA. The researchers are presenting their technology at the Berlin Air Show ILA from June 01 to 04, 2016 in Berlin (Hall 04, Booth 202). In a further step, the scientists are working on complex prism-grating structures.